Hi guys! 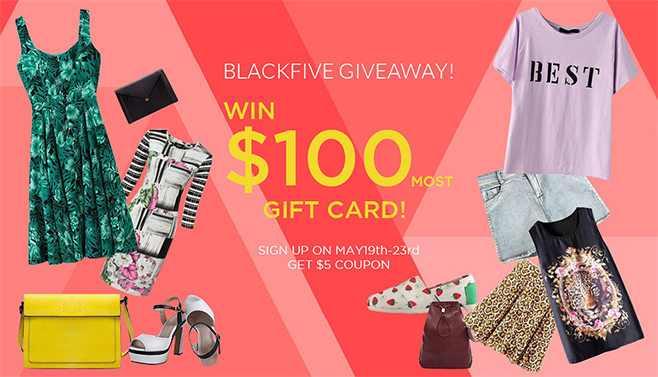 This will be just a quick note, to let you know that Blackfive are hosting their very own first giveaway where you could win a 30-100$ gift card! Everyone who signs up during 19th-23rd of May, will get a 5$ coupon. The winners of the gift card will be published on 26th of May on their website. Best of luck from me! Cheers! Good luck to all girls! I am glad you are starting to see the benefits of working out! Actually, working out is a great way to put on (healthy) weight as well— assuming you are eating enough (and enough of the right stuff….). Recently I fell off the workout wagon and need to get back to it. It is actually something I really enjoy, but have been so busy lately I am struggling to focus the necessary time. Alas! !